Arbitration has evolved to become an internationally accepted dispute resolution method of choice. 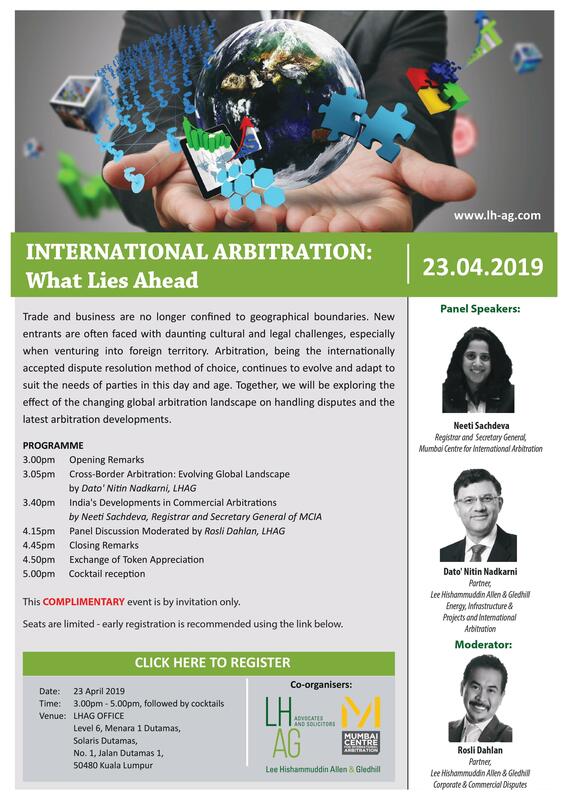 If you’ve always been curious to learn more about cross-border arbitration, and how it continues to adapt to suit today’s needs and technological advancements, don’t miss this special two-hour presentation on Tuesday, 23 April. Dato’ Nitin Nadkarni, chairman of Lee Hishammuddin Allen & Gledhill’s Partners Committee, and Ms Neeti Sachdeva, registrar and secretary-general of the Mumbai Centre for International Arbitration (MCIA), will explore the effect of the changing arbitration landscape on handling disputes and the latest developments in the field, drawing examples globally and from India. Dato’ Nitin also heads the firm’s Energy, Infrastructure & Projects and International Arbitration Practice. LHAG partner Rosli Dahlan, who heads the Corporate & Commercial Disputes Practice, will moderate the panel discussion. This event is brought to you by LHAG’s India desk, our dedicated team overseeing Malaysian investments in the sub-continent and Indian investments in Malaysia. Should you have any queries relating to Malaysian investments in India or vice versa, please contact partners S Saravana Kumar (sks@lh-ag.com) or Darshendev Singh (ds@lh-ag.com). For more details on the talk, please click here.